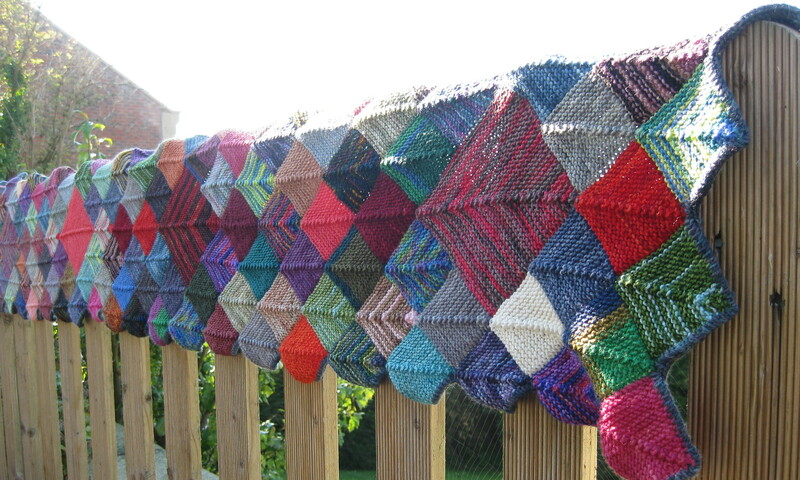 There is an essay by the Yarn Harlot where she talks about how being a process knitter means that, when you spot a huge mistake that requires ripping back a big load of knitting, it is strange that it doesn’t make you happy to have to do all the knitting again. 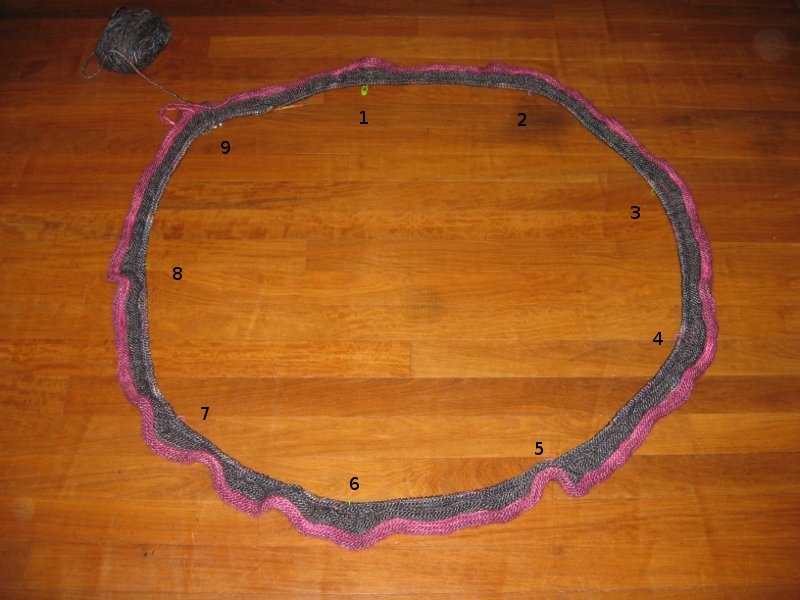 Yesterday, I was puzzled by an instruction in the pattern for my Swirl, so I went looking for enlightenment online. 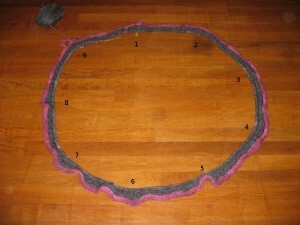 I looked on the Knit Swirl website, then wandered over to the Ravelry group. As with so many rav groups, there are a number of interesting conversations, so I started browsing through, picking out the interesting threads. There were quite a few threads started by people bemoaning the loss of swirls in progress due to many different types of user error. 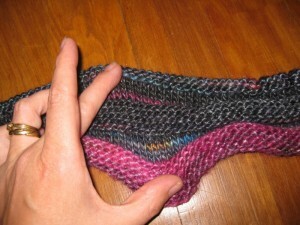 With such a long cast-on, there is the stress of whether the stitches are joined without a twist. Some had fallen prey to this. The author of Knit Swirl, Sandra McGuiver, chips in with heartening comments and encouragement every so often. She finished one comment with something along the lines of, “swirls are much better with 8 segments. 7, or even 9 will not work so well”. There’s an understatement. The swirls are all designed around beautiful octagonal structures. 7 or 9 sections would be a serious problem. I recall reading this comment and snorting with derision (I’m alone in the house with the kids this week – I can snort aloud if I want to). Who wouldn’t check the number of sections? Who can’t count to 8? There are no words (at least not printable ones). At least it shouldn’t take this long to knit back to this point, since I have knitted 1590 extra stitches. Yes, I just worked that out. I thought it might help. There are two good points to take away from this lesson. I absolutely love the fabric this is making and it is going to look amazing when it is finished. See how the colours are looking? Isn’t it fabulous? It is going to be a little while longer before it is ready because I have to frog it right back to nothing. I’ve got to do that sodding cast-on again. The cat is shut in the kitchen, I’m going to rip it back. Good night. Next PostNext Ready, aim, fire!